Dual Elfin is a variation of Elfin. It is possibly Elfin's original evolution. Dual Elfin has similarities to a frog. Dual Elfin's Specialty is that she can fight as two attributes at once. A translucent Dual Elfin comes with the Pyrus Bakusphere. Dual Elfin's real form is shown on her character card. Subterra Elfin has a pair of horns and Ventus Elfin has several of feathers as her tails. Dual Elfin is in the Bakubronze series. 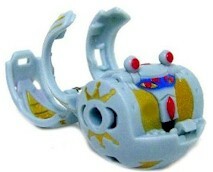 It has been released as a Special Attack Bakugan, Dual Elfin Revolution. Purchase your Dual Elfin from Amazon now!